Your health is precious – we often only become aware of this simple fact when confronted with our own inability to perform normal activities, low energy levels, mood changes, pain or illness. Harbour House Clinic is located in a newly refurbished barn conversion overlooking a stunning country house setting in the rolling hills of South Somerset. 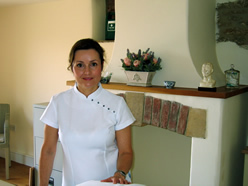 As a small and privately run clinic I dedicate myself to your very individual health needs. Chinese Medicine considers the person in his/her wholeness and focuses on restoring the equilibrium between the physical, emotional and spiritual aspects of the individual. It treats the underlying cause of a condition at the same time as addressing the specific symptom. The art of Traditional Chinese Acupuncture has been used for thousands of years to improve and maintain health. Today it holds a respected position in modern medicine. Good health should be visible from the outside and felt from the inside. Health is thus more than only the “absence of illness”. My aim is to help you to regain and maintain overall well-being and vitality.